The United States-Azerbaijan Chamber of Commerce (USACC) has announced about launch of the 2017 USACC Annual Conference website. Visiting the website one can regularly stay up-to-date on the latest conference information including, but not limited to, program updates, speakers, sponsorship, venue, registration and list of participating companies and government agencies. 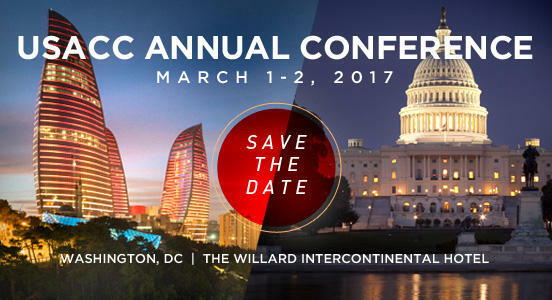 The USACC will held the 2017 Annual Conference on United States-Azerbaijan relations at the historic Willard Inter Continental Hotel in Washington, D.C. on March 1-2, 2017. The conference promises to bring together high-level business leaders, government officials, quality speakers and preeminent experts to review and discuss the state of bilateral collaboration across various industries and initiatives. Participants will be able to hear firsthand of the myriad business and growth opportunities attendant to investing in Azerbaijan, as well as learn about the experience of industry peers through various panel discussions. USACC aims to help strengthen business ties in both countries for the benefit of private companies, and for the public and consumers they serve. While the two countries are hemispherically distant, trade has never been stronger or easier, and the desire among the business communities in both countries to forge new business opportunities has never been greater. The flow of goods and services between the two countries, while substantial, already remains susceptible to improvement in many different areas. Beyond energy, Azerbaijan's telecommunications and IT, nine different climate zones and rich soil with astonishing agricultural potential and diversity, and the legendary hospitality of its population can be tapped into by numerous economic sectors. American companies have products and services that are highly valued in Azerbaijan. There is a tremendous demand for American-made machinery, as well as for food packaging and processing technologies. And American consumer technology producing companies could benefit tremendously from Azerbaijan's tech-savvy population. USACC is excited to announce complimentary business matchmaking services for Azerbaijani companies. To register your interest in the conference, please e-mail: chamber@usacc.org with brief company information by December 16, 2017.